Sorry for not updating for a while guys. 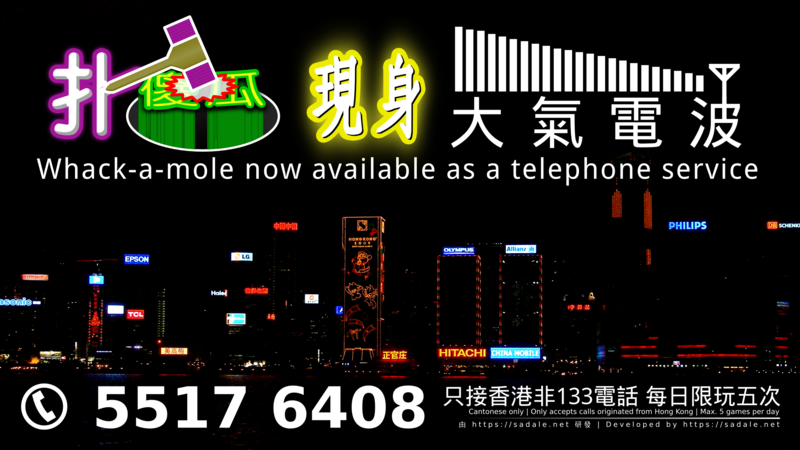 Spent almost $100 on hardware and stuffs, worked for more than a month, Whack-a-mole over telephone is finally completed! 各位! 好耐無打廣東話嘅blostpost. 耗資陸佰港元. 動工參拾陸夜. 小弟嘅電話扑傻瓜終於搞掂喇! Behold the gameplay(Cantonese with English subtitle)! Level 1: Score requirement: 0; Three random animal sounds. Each requires the player to press a key. Level 2: Score requirement: 10; Three additional random synth'd wave sounds. Each requires the player to press a key. Level 3: Score requirement: 30; Three additional random voice of numbers. Each requires the player to press another key that is usually inconsistent with the number that the player have heard. Level 4: Score requirement: 60; After this level, the player has to press certain key for every 5 sounds, regardless what is the sound that the player has heard. Level 5: Score requirement: 100; Upon hearing any of 5 random sounds, the players has to press a key. Upon hearing another 5 random sounds, the players has to press another key. Upon hearing yet another 3 random sounds, the player has to press yet another key. LEVEL 1: 所需分數: 0; 三個隨機動物聲. 每個聲要撳一粒制. LEVEL 2: 所需分數: 10; 三個隨機電腦合成聲. 每個聲要撳一粒制. LEVEL 3: 所需分數: 30; 三個隨機數字聲. 每個聲要撳一粒制, 而嗰粒制通常唔係你聽到嗰個數字嘅聲. LEVEL 4: 所需分數: 60; 每聽到五個聲就要撳某一粒制. LEVEL 5: 所需分數: 100; 聽到某五種聲要撳一粒制. 聽到另外某五種聲要撳另一粒制. 聽到另外某三種聲又要撳另一粒制. If you press the wrong key, or if you're too slow, then you lose. If your score is the highest among everyone else, the score will be recorded.